Gemma Thompson is one of my favorite guitarists out there. She.. is amazing. She plays guitar in the band Savages. I spent some time thinking about what about her playing I like. And it’s pretty simple really. It’s exciting. Potentially ‘dangerous’. Violent yet controlled. If you’ve followed me on this blog for a while, I love the post-punk movement of the 80s, and she has a style that reminds me of Bauhaus era Daniel Ash. I’d be curious if she would call Daniel an influence at all. I love hearing guitar that is unhinged, not because of speed or technique, but with aggressive feedback and sharp open string ‘schwing’. She’s got that dialed. I recently saw on her Instagram that she posted a board shot. 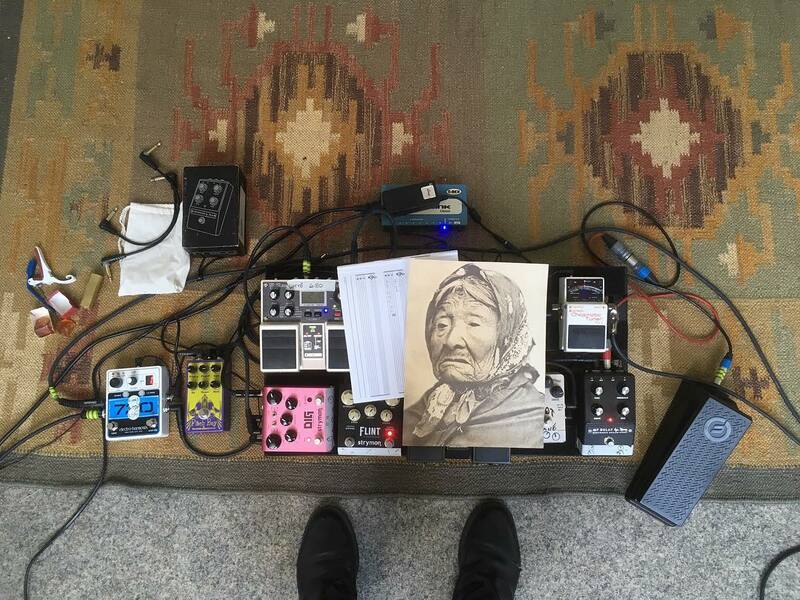 Some of the pedals are behind a picture of Princess Angeline, but still, I wanted to nerd out and do a break down of the pedals. Any guesses what’s under the picture? Let’s hear them! Comment below! She was pretty set with MXR Blue Box, Dist + and Maxon OD808 throughout the years with her different board setups.. so I’m guessing there should at least one of those mentioned. Then again who knows haha.